Android is 1st developed by a Silicon Valley company Android Inc. Android is a mobile operating system and developed by Google. Later it is modified with Linux Os. Google mainly develops android for smartphones and tablets. It also used for apps in television, digital camera, etc. More than 1 billion mobile devices use the Android OS. Totally, there are 14 versions of Android at present. Why KaaShiv InfoTech Company to learn Android Training in Chennai? Kaashiv provides Best Android Training in Chennai with professional trainers who provide real-time training and also projects to the candidates for better understanding. Why Students Enroll for real time Android Training in Chennai ? Android Technology is the fastest growing smartphone OS in the world. At present, Android holds 57% of the market share in the worldwide smartphone market. Kaashiv trains you in the Android field with depth knowledge on App development with Java programming. 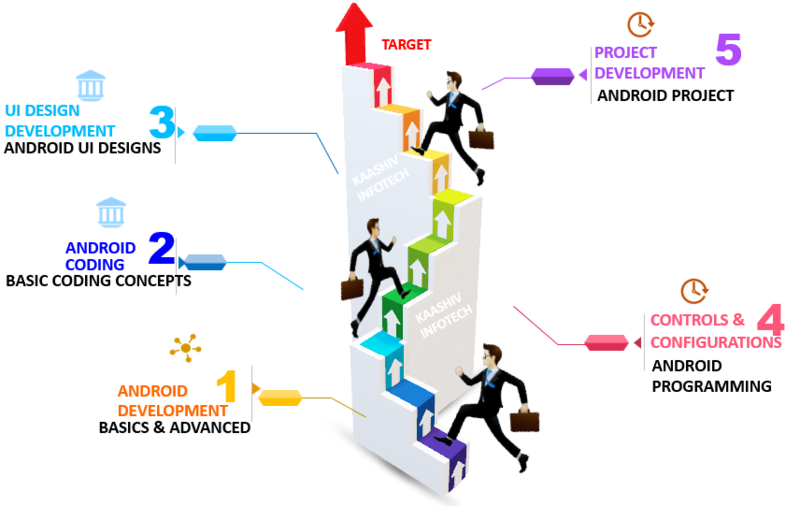 Android has huge career aspects in the IT field for mobile developers. Students undergone Android training will be expertise in Android Creation (In multiple platforms like Android, IOS). For Android Training 120 concepts from Basic to Advanced will be covered.